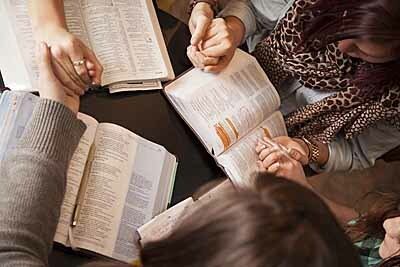 Pray to determine which lesson or series would best suite your group. Consider a long-term strategy of how to work through the various series available. Make sufficient copies of the printable version of the lesson you will be teaching. Page 2 of the printable version provides two student handouts. Page 3 provides multiple leader copies that may be helpful if hosting multiple small groups. Print the PDF in "actual size," as opposed to the "fit to page" option, if your printer allows. Work through the lesson yourself prior to teaching it. This is essential in preparing your heart for what God would have you to share. Take note of any thoughts or points that come to mind that may be beneficial to share with your group. Begin the lesson by considering an introductory thought. Take the main point, or emphasis of the lesson, and share an illustration or scenario that your audience can relate to. This will begin to get the group focused on the topic. This may be a good place to discuss the importance of the lesson you are about to study. Work through the lesson. Include additional thoughts and points that you have. Be sure to give the answers to the blanks on the handout where needed. Ask for volunteers to be ready to read the Scripture verses. Give the group an opportunity to discuss answers that are more subjective. Encourage conversation to keep the group focused and involved. Incorporate discussion questions whenever possible. Ask questions such as: Why is this truth important? What do other Scripture verses say about this point? What does this teach us about God, our world, and ourselves? Take two or three points from the lesson and share an illustration. If you have trouble thinking of something, create and discuss a made-up scenario that brings out the point being made. Illustrations help keep the group’s attention and add more "life” to the lesson, especially if you can mix in a little humor! Bring out the practical application(s) of the lesson. Make a final appeal for “action” at the end, or reemphasize points of application you discussed earlier in the lesson. A group discussion on specific ways to apply the lesson could make for great conversation! Some of the greatest moments we can have with other believers is spending time discussing God’s Word. As God works to accomplish His will through each of us, may we take full advantage of opportunities to equip each other in the truth of Scripture and encourage each other in our faith!